Wayne, PA – Bracket, a leading clinical trial specialty services provider, announced platform updates to Bracket eCOATM and Bracket RTSMTM to include native support for SMS messaging with patients and other stakeholders in clinical research programs. This important update expands the medication compliance and adherence functionality across Bracket’s eClinical portfolio, and provides an effective solution for supporting patients participating in clinical trials. “Patient communication tools are an essential component of effective patient engagement programs, and these updates reinforce our commitment to improving the patient experience in research programs through progressive methods offered by healthcare IT,” said Jeff Kinell, Chief Executive Officer for Bracket. Text messaging support as a valuable reminder with ease of use. “Medication adherence is a critical variable in clinical trial success. Introducing a simple and effective communication tool like SMS could robustly improve compliance to medication regimens and a broad range of clinical trial procedures,” stated Dr. David Daniel, Chief Medical Officer of Bracket. 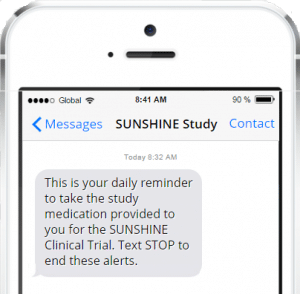 In addition to direct-to-patient communication, the mobile text messaging platform can be leveraged to issue alerts to clinical trial sites, study sponsors, and CROs who are working with Bracket’s RTSM and eCOA tools. Bracket launched the initial SMS platform in 2015, and will continue to integrate patient engagement tools across the product line through a series of product releases and integrations in 2016. Bracket, with seven offices and more than 500 employees worldwide, is a specialty services provider dedicated to helping biopharmaceutical sponsors and contract research organizations increase the power of their clinical research data by leveraging core competencies in Science, Technology, and Service. Bracket eCOA™ is a flexible platform for electronic clinical outcomes assessments. Bracket RTSM™ is a best-in-breed, scalable and configurable clinical IRT solution for the life sciences industry. Bracket Rater Training and Quality Assurance improve outcomes through customized training and quality assurance programs. Learn more about Bracket.